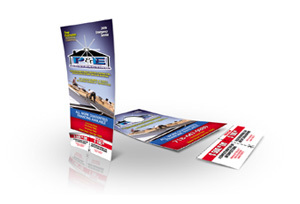 Door Hangers are a great way to target residential customers. Your message on a custom door hanger is the first thing they see when they come home and it won't get mixed in with the junk mail. 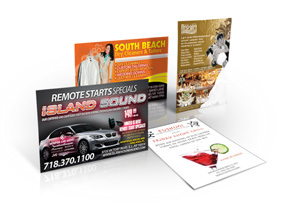 Reduced Printing offers 16-POINT THICK Door Hangers printed FULL-COLOR TWO SIDES with the added protection of High-Gloss AQUEOUS Coating on at no additional charge! Create a powerful message that will really grab them on their way into the house. It's almost as good as knocking on their door! 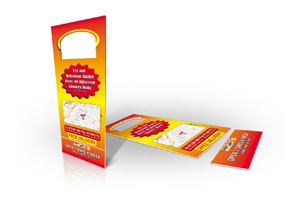 What Businesses Can Use Door Hangers? Announce a New Business - it can be tough to get the local neighborhood's attention when opening up a new small business. Putting door hangers out around the local area is a great way to meet some of your potential customers and make them aware or your grand opening. Don't be afraid to chat it up as you walk around putting them on neighbor's doors. Restaurant Menus - folding menus will often get lost. A door hanger that doubles as a menu allows your employees to stick them on the neighboring doors when making a delivery as well as giving the customer a way to hang them on their fridge without falling off. If they see it, they are more likely to use it when they get the urge to order out. Reminders - how often do your employees show up at meetings without their notes or other materials? Why leave it to risk when you can create a checklist for the meeting and leave it on their office door? When they arrive in the morning, they are not only being reminded there is a meeting but also what they need to bring. Coupons and Discount Codes - for a small business, this is the perfect way to be able to monitor your print advertising campaigns. By creating a unique code every time you place a new order, you can track what types of door hangers are working the best for your business. The customer will have to enter this code to receive their discount, so it provides very important feedback about the types of advertising that are the most effective for different markets. 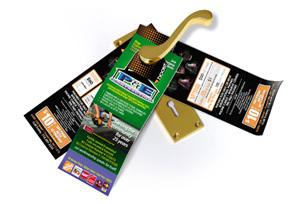 If you need help ordering or designing your premium door hangers, please call us at 888-888-0649 or click here to use our online support contact form. Reduced Printing does not take things for granted and just print your files without checking them first. We manually check your file for the most common problems & fix them FREE when possible. So don't worry if your files aren't perfect the first time you upload them. The price you found advertised elsewhere includes everything you need, including any add-on options. The total product quantity is the same. The advertised price is for four-color-process offset printing (not one-color, two-color, or black and white, not digital printing). We offer Money Back Guarantee to our first-time RETAIL customers for print orders up to $100. 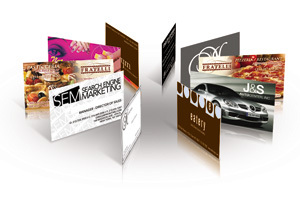 This guarantee is solely extended to Premium Business Cards and Standard Postcards products only. If you are not entirely satisfied with the finished printed product that this guarantee covers, you can send it back to us for a full refund of the printing cost only. Any products ordered with a subtotal over $100.00 are considered to be a larger order and are not part of this guarantee. It is recommended that you first place a small order before placing a large order for this guarantee to be valid. This is a good way to to know what quality you can expect from us on larger orders. By adding 1-day rush service, we guarantee that your job will ship next business day, or we will refund you 100% of your rush charge. Please see our "turnaround times" page for more information. * As a customer, you are responsible for submitting print ready files according to the guidelines in our "preparing files" page. However, we understand this doesn't always happen perfectly. That's why we check your files - but please understand that we do not check for spelling errors, factual data such as phone numbers, names and addresses, prices, text or any content of your writing - we only check for the technical setup of your file to make certain that it will conform to print industry standards when it prints. We can only fix files within limits of whats possible. For example if your file is low resolution, we can not add resolution to it - that we consider impossible. ** Reduced Printing retains the sole right to reject price guarantee requests that do not sufficiently meet the requirements outlined above or do not provide sufficient proof of a lower competitive price on the same product with exactly the same specifications. Items eligible for FREE Shipping are not considered part of any price comparison. 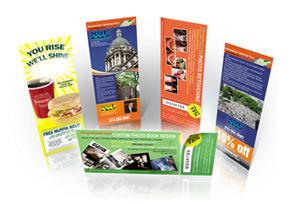 This offer only applies to premium business cards, brochures, and postcards. Special offers, discount coupons, sale priced items and "first time customer" discounts are not considered part of any price comparison. *** Money Back Guarantee is only for FIRST TIME RETAIL CUSTOMERS who had never ordered from us before. This guarantee is not available to customers who apply for Reseller account because we expect customers in the trade to know what they are ordering. Likewise, returning customers already know what to expect from us therefore this guarantee can not apply. We will refund the printing price only. Customer will be responsible for shipping the product back to us in its entirety (full quantity). Customer is responsible for the shipping charges - we do not provide return shipping labels. Please allow up to 15 business days to process your refund. **** Claims for defects, damages, or shortages must be made by the client in writing no later than 1 calendar day after delivery. Because of limitations with the process of gangrun printing, AND the differences in equipment, paper, and neighboring image ink requirements - the accuracy of color reproduction IS NOT guaranteed. ***** We can not be responsible for mechanical malfunctions, acts of god, or other unforeseen circumstances. Although we make every intention of meeting all posted turnaround times, our STANDARD turnaround is intended as an estimate and not a guarantee. If you have difficulty placing an order, please feel free to contact us.